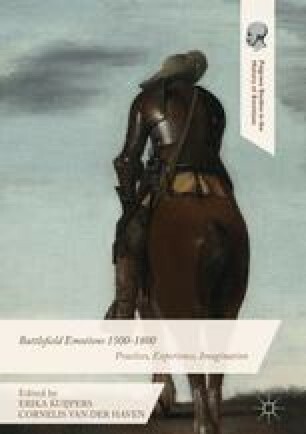 Focusing on the writings of military theorists, theologians, and physicians as well as on self-narrative sources from the Thirty Years’ War and Turkish wars, this chapter analyses the conceptualisations of soldierly fear in the seventeenth century. These texts drew a distinction between right and false fearlessness in battle: the perceived tension between godless and god-fearing fears, self-destructive audacity and life-saving courage. Contemporaries also debated the pathological consequences and violent impact of fear, anxiety and panic, and the permissible religious and magical remedies against soldierly fear. ‘Battlefield Fear(lessness)’ begins and concludes with an interpretation of the controversy about the magical sword Gustavus Adolphus of Sweden purportedly carried in the Battle of Lützen.